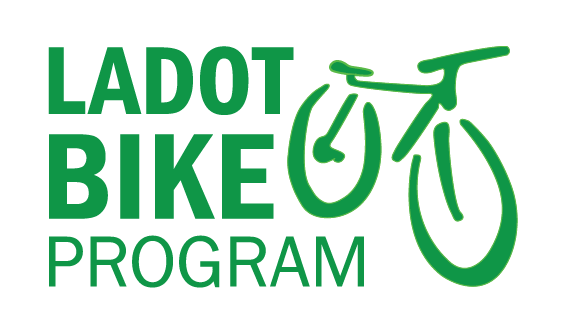 Since 2010 the LADOT Bike Program has worked diligently to introduce, formalize, and refine bicycle corrals for the City of Los Angeles. We have seen huge successes in our process, from the revival of the York Boulevard commercial corridor and pedestrian space to the overcrowding of our much needed Abbot Kinney corrals. We have also tested and modified designs, beginning with U-racks, moving to the Dero Cyclestall Elite, and now a modified version of the Cyclestall that better serves cargo bicycles. We are about to embark on our largest yet deployment of bicycle corrals in Los Angeles and hereby announce a call for new applications. In the next two years, the department’s strategic plan, Great Streets for Los Angeles, calls for the installation of over 25 bicycle corrals. There are many criteria that go into corral site selection and approval, but before we explain the fine print, we wanted to take you through a tour of lessons learned and the corral history that goes into today’s revision. Our very first York Boulevard Bicycle Corral was yarn bombed to mark the new year! Our first corral on York Boulevard featured many elements that have been discontinued due to cost, functionality, and permanence. Our first design featured welded U racks that needed to be pre-assembled and lifted into place by crane. The design also featured asphalt buffers that were repeatedly damaged by cars and delivery vehicles. This design has been popular with users, as it allows a barrier-free approach to parking. The lack of barrier, though convenient, does not provide as much protection as a structure that fully separates the parking from the travel lanes, and therefore, after considering all factors, the next round of corrals was modified significantly. Our next round of corrals consisted of 11 custom Dero Cyclestall Elites. The new design, which fully separates the bicycle parking from travel lanes has sometimes been criticized by users as difficult to enter, creates a pedestrian interaction for people dismounting their bicycles, orienting the now-pedestrians towards the sidewalk and away from any conflict with moving vehicles. This setting creates a more conscientious entry and exit from the bicycle parking area, eliminating conflicts between dismounted riders and those passing as well as driver-bicycle conflicts. Beyond this change, the new corral design utilizes rubber wheel stops, durable buffers against parking cars and reflective flexible delineators that make the corral more visible to approaching vehicles, especially at night. These corrals are installed in Atwater Village, Venice, Cypress Park, North Hollywood, the Arts District, Eagle Rock, Larchmont Village, Westood Village, and (coming soon!) Downtown’s Historic Core. This round of installations presented rich feedback on corral placement in relation to travel lanes and bicycle facilities, user density, and the dynamics of nearby bicycle friendly neighborhoods. Taking these lessons into consideration, we went back to the drawing board again for our next corral order, incorporating both user and safety considerations. Our next phase will feature the custom Dero Cyclestall Elite, further modified with shorter side arms that allow for ample entry space. We’ve also ordered 5 corral extenders, allowing sponsors to select a longer version of the corral, expanding parking capacity from 14 spaces (as seen above these corrals can actually fit up to 18 bicycles) to 20 (24) spaces. The additions fall within the two-parking space area, so the expanded corral does not require further parking impacts. New Corrals await their future street! We are currently looking for locations for our next corrals! If you own a business or are part of a community organization that would like to sponsor a corral, check out our corral page, FAQs, and the corral application below. All sponsors are required to sign a maintenance agreement with the City, where the partner agrees to keep the corral clean and clear of debris (corral placement restricts street sweeping). Once a corral location is preliminarily reviewed and a maintenance agreement signed, the project enters engineering design, which at times reveals other complications or reasons a corral cannot be installed at that location. If the project reaches design completion, the installation is coordinated by LADOT. 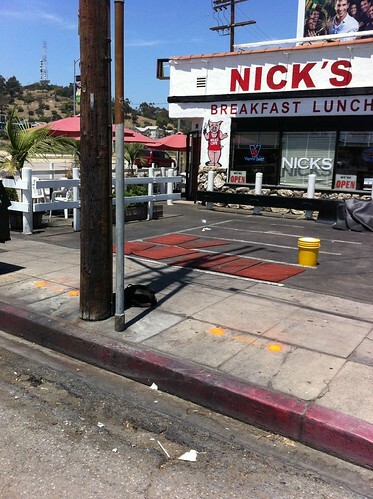 The site of the soon-to-be installed bike corral in Atwater Village. It seems so distant, but February 18th, 2011, just two and a half years ago, was when the city’s first bike corral was installed on York Boulevard in Northeast LA. Getting the corral off the drawing board and onto the ground was a lengthy process, but ultimately the project was able to march ahead thanks to both local residents’ support and political will. The day the bike corral officially opened was rightfully celebrated as a great stride in the city’s efforts to become more bicycle friendly. More and more people are embracing bicycling lately with pleasant summer weather and a growing number of bicycle facilities being implemented. 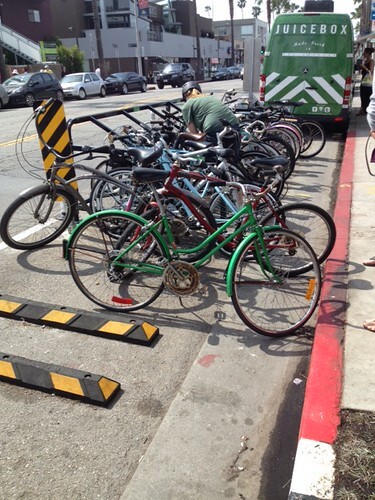 Of course, with increased bicycling comes the need for safe, secure bicycle parking. Out in the valley about a dozen bike racks have been marked along Sherman Way. Some of the bike rack requests being fulfilled are at: Taco y Cemitas Puebla, Hot Nail Salon, Musica Latina, and WSS Shoes. A handful of requests brought the LADOT Bike Program to Cypress Ave. Among the businesses to get bike racks along this corridor are: Uno Market, Guadalajara Bakery, Cypress Liquior, and Nore’s Beauty Salon. The most recent neighborhood the Bike Program visited, where sufficient requests allowed about 40 bike racks to be marked for installation. 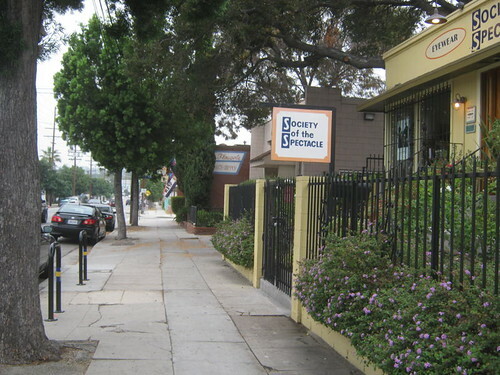 Destinations like the Eagle Rock Library, Dave’s Chillin’ and Grillin’, and All Star Lanes Bowling will see new bike parking soon. 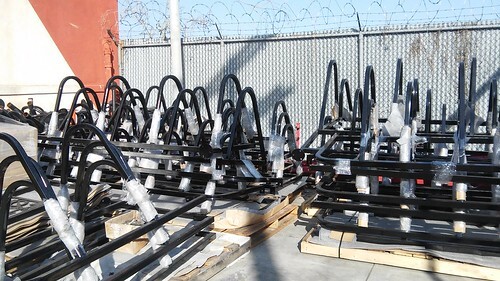 Home of Los Angeles’ first bike corral, more bike racks have been marked for installation along York Blvd. Businesses soon to receive bike parking include: Mariscos, Hair Zone Barber Shop, The York, and Villa Sombrero. Plenty of destinations along Motor Ave. have been marked: Computech, Mama’s Original Pizza & Pasta, Iman Cultural Center, and The Garage will be graced with bike racks in the near future. Does your part of the city need more bike racks? Did we miss locations on our recent visits? Fill out a bike rack request form or tell us in the comments if you know areas that need bike parking. Spring Street has bike parking too! We hope that you’ve had a chance to ride L.A.’s newest bicycling facilities. 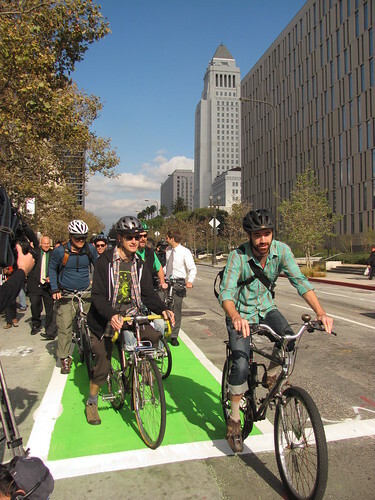 For more green bike lanes coverage, be sure to check out (sorry if I forgot anyone) L.A. Streetsblog, Blogdowntown, The East Sider LA, Los Angeles Wave, Mis Neighbors, L.A. Eco-Village blog, NBC, the L.A. Beat, and the L.A. Times. We really hope that this facility will encourage more people to get out on their bicycles to enjoy Downtown. To help bicyclists enjoy Downtown even more, we wanted to make sure that everyone knew where to find bicycle parking available along the corridor. Follow us below the fold to find out where sidewalk bicycle parking is available on Spring Street.